A whole grain is the entire kernel of grain. That means the bran, germ and endosperm are all present and remain during processing. Amaranth - Amaranthus caudatus - This has a peppery taste and a high level of protein. 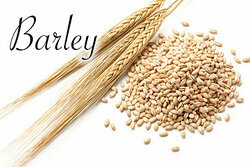 Barley - Hordeum spp. - This includes hull-less or naked barley but not pearled. Buckwheat and Tartary buckwheat - Fagopyrum spp. - This is not technically a grain and has high levels of an antioxidant called rutin. Canary seed - Phalaris canariensis - This is used in Mexico to make atole, a hot beverage. It is used as food in the Canary Islands, Italy and North Africa. Job's tears - Coizlacryma-jobi - This can grow in higher altitudes where corn and rice cannot grow well. Fonio, black fonio, Asian millet - Digitaria spp. - This is widely used in Africa. Kañiwa - Chenopodium pallidicaule - a cousin of quinoa, this is a pseudo-cereal. It has a high level of protein. Maize or corn - Zea mays. This has more antioxidants than any grain or vegetable. Millets - Brachiaria spp., Pennisetum spp., Panicum spp., Setaria spp., Paspalum spp., Eleusine spp., Echinochloa spp - This has varieties like white, red, gray or yellow and it is gluten-free. Oats - Avena spp. This includes hull-less or naked oats - The oat bran and germ are not usually removed during processing. Quinoa - Chenopodium quinoa Willd. - This comes from the Andes and is not a true grain; but, it is related to swiss chard and beets. Rice - Oryza spp. - This includes brown, black, red, and other colored rice varieties - This is the most easily digested grain. Rye - Secale spp. - This can grow in wet and cold conditions; so, it is cultivated in northern Europe and Russia. Spelt - Also known as dinkel wheat or hulled wheat, this grain has more protein that regular wheat. Teff - Eragrotis spp. - This is widely used in Ethopia. Triticale - x triticosecale rimpaui - This is a hybrid of durum wheat and rye. Wheat - Triticum spp. - This includes durums, emmer, einkorn, faro, khorasan wheat and spelt. Wild rice - Zizania spp. - This is not technically rice, but the seed of an aquatic grass. These examples of whole grains show the diversity of options available around the world for whole grains. "Whole Grain Examples." YourDictionary, n.d. Web. 19 April 2019. <https://examples.yourdictionary.com/whole-grain-examples.html>.